In marriage we need to find a way how to make common decisions. In my case we decided that my wife will make those routine, unimportant decisions as what to cook for a dinner, how will spend a weekend or holidays or what to do with the money we have. My responsibility is to take the key, long-term decisions which will have the major influence on our well-being. So I decide what soccer team is our favorite for the next season, brand of a BBQ grill and what is our relationship towards EU. In the IMS network there are many key network functions which take the decisions about routing, charging, applied services etc. But should I choose one which would allow me to manage the whole network, I’d go for DNS. Without DNS there would be no IMS. And don’t get me wrong. This is not only about the usage of IP protocol and symbolic address translation. DNS is responsible also for other vital mechanisms as routing, load-sharing, resiliency, service discovery and zero-configuration, provisioning, mobile number portability, timezone support, etc. DNS is defined in many documents the most important for us are IETF RFC 1034, RFC 1035, RFC 3646 and mainly in RFC 3263 and RFC 7984 and GSMA IR.67. 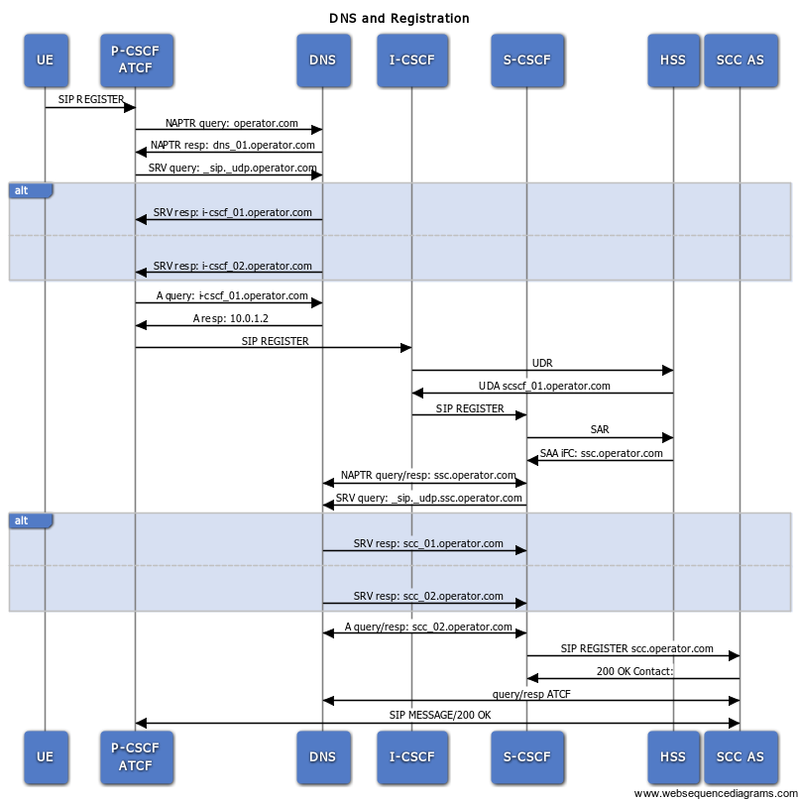 Let’s take a look on routing in the IMS network. We can start with the registration. Well, the DNS is used also during the ePC attach procedure. But we don’t discuses particular access networks here. (The Protocol Configuration Options – PCO response will contain the IPv4/IPv6 address of the P-CSCF anyway). In the IMS the P-CSCF will take the Request-URI header of the SIP REGISTER message and based on the DNS response will identify the I-CSCF. And it’s not just about the registration. As you probably know, the routing in SIP is done either based on a top most Route header, or if there is no Route header the routing is done based on the Request-URI, which contains the address of the final recipient. And every time before a network element can pass the message to a next hop, it has to discover what type of transport will be used (UDP, TCP, TLS, SCTP), what port to use and what numeric IP (IPv4/IPv6). This procedure we call SIP Server Locating. Sometimes the information is already present in the message headers (e.g. 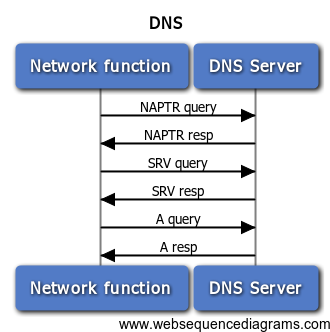 routing of responses), sometimes we can use some defaults and in all other cases we use the DNS. As an example we mentioned the SIP REGISTER message on P-CSCF, because in this case we do the SIP routing based on the domain name, which user is registering to. That means we can’t use any defaults and we have to trigger the DNS. However, as mentioned, it applies in general to all the SIP routing. The SIP Server discovery is done in 3 steps to discover the Transport, Port and IP. That also corresponds to 3 DNS queries NAPTR, SRV and A/AAA. Firstly we send the NAPTR request in order to find the right name server (as the I-CSCF can be in a different network). If the target (R-URI or the top most Route header) is a numeric IP, we use UDP transport layer. If no transport is specified, but port is specified, we also use UDP. Otherwise we can specify the transport directly. For sips we always use TLS. If none of the rules specified above applies, then we have to use DNS to resolve the address. IN NAPTR 10    50   "s"   "SIPS+D2T"   ""      _sips._tcp.icscf.ims.operator.com. IN NAPTR 20    50   "s"   "SIP+D2T"    ""      _sip._tcp.icscf.ims.operator.com. IN NAPTR 100   50   "s"   "SIP+D2U"    ""      _sip._udp.t.ims.operator.com. The third column defines, what will be the order/priority. The row with the lowest value has the highest priority. In case when more rows have the same priority, then we loadshare using preference/weights in the fourth column. The flag “s” then tells to us, that the next step is the DNS SRV request. Again, for more details, please refer to RFC. It is even easier. If the port is specified, simply us it. If the target is a numeric IP address, we use default ports for given transport layers. Otherwise we send an SRV request to DNS. Note that the SRV can already contain A/AAA records. To discover an exact IP address is just a piece of cake. Either the numeric IP is present, then we will use it. Or, if the SRV request was already done, use the returned IP address if present. If it wasn’t present, perform A query based on that result. If we haven’t done SRV request, then do A query using the SIP URI domain name. Use the numeric IP in the order returned by DNS. On the first picture of routing in IMS above we have a simplified network with two sites. One is responsible for instance for the customers physically located in the west of a country (e.g. Vancouver) and the other one for those in the east (Montreal). If the DNS will do a loadsharing/loadbalancing, the SIP REGISTER message from Vancouver can end up in the IMS core (S/I-CSCF) in Montreal. Also the DNS is typically responsible for an AS selection because the iFCs usually contain only generic FQDNs of application servers. During the session establishment we then use the DNS to find the proper routing based on the ENUM response. REGEXP – Contains a substitution expression that is applied to the original string held by the AS in order to construct the next domain name to lookup. REPLACEMENT – A 1 octet length field followed by the next NAME to query for NAPTR, SRV, or address records depending on the value of the flags field. If replacement is used this must be a fully qualified domain-name. The ENUM request can be send by both S-CSCF or AS. The ENUM is as a database indicating the presence in the IMS and for Mobile Number Portability (MNP). As we can see a correctly working DNS is a must for a 4G network. When we look at the 5G the DNS will become even more critical component. The next generation should be about devices – IoT if you want. Think about all those devices. Some researches show that there will be about 50 billion connected devices in 2020. All these devices will need to use some services. How to do the service discovery when the device itself is supposed to be ‘plug&play’? Sure, the answer is DNS. 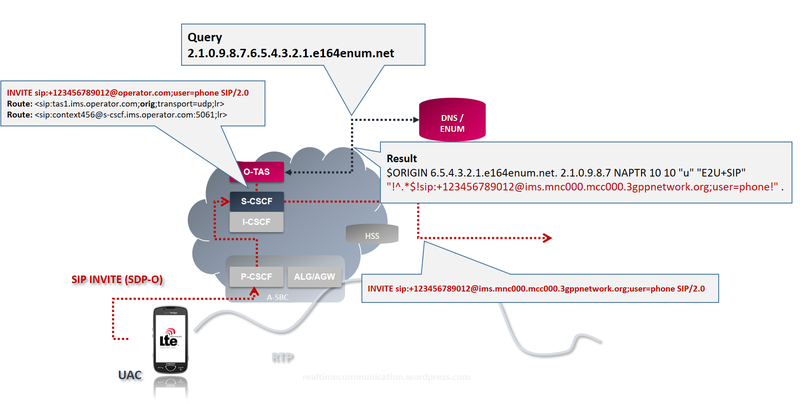 This entry was posted in IMS and tagged DNS, ENUM, Locating SIP Servers, NAPTR, SIP Routing, SIP Server Location, volte dns. Bookmark the permalink.